Many businesses and individuals must make estimated federal income tax payments. Your tax preparer may have told you that you need to make these payments, or maybe you have a lot of business income and realized you must pay taxes on them. The IRS won't warn you about the need to make estimated tax payments. In part, this is because the need for making these payments may not be evident until you file your tax return. This information is for general purposes only. If you think you may need to make estimated tax payments, talk to your tax professional and do some planning. Not making estimated tax payments can result in an underpayment, and fines and penalties. When Must I Make Estimated Federal Income Tax Payments? Businesses that are not corporations are pass-through taxing entities, meaning that the business taxes pass through to the owners on their personal income tax returns. So, If your business is a sole proprietorship or single-member LLC, your business tax is calculated on Schedule C - Profit or Loss for Business, which is included in your personal tax return. If your business is a partnership, multiple-member LLC, or S corporation, your share of the profits of the business is shown on a Schedule K-1, which is included in your personal tax return. You expect to owe at least $1,000 in tax for this calendar year after subtracting your withholding and credits. If you are filing a tax return for a corporation, you generally have to make estimated tax payments for your corporation if you expect it to owe tax of $500 or more when you file the corporate return. How Do I Know If I Must Make Estimated Tax Payments? As you and your tax preparer work on your business tax return, keep the above numbers in mind. If you are a sole proprietor, partner, or s corporation shareholder, you can estimate your taxes using the estimated tax worksheet in Publication 505: Withholding and Estimated Tax. If you are a corporation, use form 1120-W to estimate the taxes you owe. 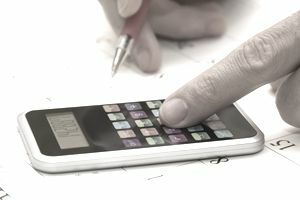 William Perez, Tax Planning Expert, has some tips for estimated taxes, including some online calculators. Or here's a quick way to get a general idea of whether you need to make estimated tax payments. These general estimators are not intended to be tax advice. Each business situation is different, and you may have forgotten something or miscalculated. If you are not sure if you have estimated correctly, check with your tax professional. What Are the Due Dates for Estimated Tax Payments? For income received for the period January 1 through March 31, the due date is April 15. For income received for the period April 1 through May 31, the due date is June 15. For income received for the period June 1 through August 31, the due date is September 15. For income received for the period September 1 through December 31, the due date is January 15 of the next year. How Much Must I Pay in Estimated Taxes? 90% of your total expected tax for this year. 100% of the total tax shown on your last year's return. Your last year tax return must cover all 12 months. How Do I Make These Estimated Tax Payments? Make an estimated payment on your personal tax return using Form 1040-ES. Make an estimated payment for your corporation using form 1120-W. Through the Electronic Federal Tax Payment System (EFTPS) (required for corporate estimated taxes). Direct Pay, or Credit/Debit card. Be sure to include the correct category of payment you are making (Estimated). If you are paying by check, be sure to include the estimated tax payment voucher. You can find the voucher on Form 1040-ES. See this IRS article on Estimated Taxes or IRS Publication 505: Withholding and Estimated Tax Payments. You can also find more details on the IRS: Instructions for Form 1040-ES or the Instructions for Form 1120-W.
How Do I Calculate Estimated Taxes for My Business?